Lammas: the First Harvest. Image from Cambridge Community Television. 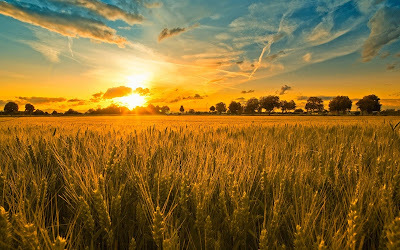 "The corn is as high as a elephant’s eye..."
Tuesday, July 31 or Wednesday, August 1, 2012, is a good time to celebrate Lammas, First Harvest. Lord Sun is in Leo and Lady Moon is in her second quarter in Aquarius. As both Leo (Fire) and Aquarius (Air) are masculine signs, I encourage you to incorporate the feminine elements Water and Earth into your celebrations. This will create a better balance. Use the colors red, gold, orange, yellow, bronze, citrine, green, and grey in your dress and decor. Lammas means “Loaf Mass” and refers to the first loaf of bread (or cornbread) made from the first-harvested grain of the season, so serving your guests foods that use corn, rye, and/or wheat in their composition is appropriate. Some possibilities are: gingerbread, cornbread, and popcorn. In addition, include any locally grown produce that is in season, berries and berry pies, roast lamb, ale, and fruit wine, according to your budget and preference. Begin your feast by giving thanks for the positive things in your life. Encourage your guests to do the same. Honor grain goddesses such as Ceres and Tonantzin. Tonantzin was an Aztec goddess of corn and the earth. Lore says that after the conquistadores destroyed Tonantzin’s temple, the Virgin Mary appeared to Juan Diego and told him to build a shrine where the destroyed temple had stood. The story of Juan Diego’s efforts to do so, the appearance of the Virgin on his cape, and the eventual building of the shrine, is well-known; what is not so well-known is that many Indians took the Virgin Mary to be another aspect of Tonantzin. Their allegiance to this representation of a familiar goddess is, therefore, not surprising. If you bake a loaf of bread for this occasion, do not slice it but let each guest tear off a bit of bread from the loaf and feed it to the person sitting to their right while saying “May food be always on your table," “May you never go hungry," and other phrases to that effect. Be sure to reserve part of the loaf to be thrown in the ceremonial fire. Bless the tools of your trade in the smoke of the fire (you may add some herbs or incense if you like). This is said to ensure prosperity and positive action in the coming year. Encourage your guests to tell and retell tales of and myths of Grain Goddesses. The story of Demeter, Hades, and Persephone is but one. You and your guests may also write down words or symbols of things you regret on a piece of paper, wrap the paper in corn husks, and toss into the fire. As these regrets burn to ashes they are released into the air and drift away, leaving you and your guests with the opportunity to begin anew.